A new feature on Apple Chief Executive Tim Cook describes him as a down-to-earth leader who is easy to talk to, and makes people easily forget that he is the CEO of one of the largest companies in the world. The cover story of the latest issue of Fortune details how Cook is changing Apple in its post-Steve Jobs era. The piece, written by Adam Lashinsky, kicks off by describing how Apple investors were shocked when Cook met and spoke with them at an investor meeting in February at the company's corporate headquarters. Cook's style is a stark change from his predecessor, Apple co-founder Steve Jobs, who despised participating in such investor events. But despite the "shifts of behavior and tone" described in Lashinsky's article, he added that Cook is maintaining "most of Apple's unique corporate culture." "In general, Apple has become slightly more open and considerably more corporate," he wrote. "In some cases Cook is taking action that Apple sorely needed and employees badly wanted. It's almost as if he is working his way through a to-do list of long overdue repairs the previous occupant (Jobs) refused to address for no reason other than obstinacy." In doing things his way, Cook has also retained his disarming personality, which Lashinsky said most employees at the company seem to prefer. 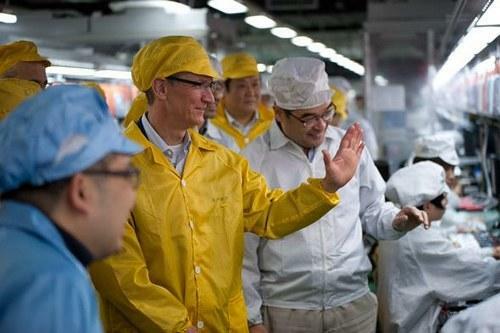 For example, Cook often sits randomly with employees in Apple's corporate cafeteria during lunch, while Jobs typically dined with design chief Jonathan Ive, who was knighted this week in his home country of the U.K.
Apple CEO Tim Cook tours an iPhone production line at a Foxconn plant in Zhengzhou, China, in March. Cook has also instituted major changes at the company, such as a considerable focus on using renewable green energy, bringing in independent audits of Apple's overseas supply chain, and also allocating $45 billion over three years toward a stock dividend and share repurchase program. And all of those changes have been made while Cook oversaw the two most successful product launches in Apple's history with the iPhone 4S last October and the third-generation iPad this March. The Fortune cover story includes comments from an unnamed CEO of "an influential tech company," who described Cook as "down to earth, noncorporate, detail-oriented, and disarming." "He's casual, grounded, and easy to talk to," they said. "I forgot he's the CEO of Apple. And that was not my experience with Jobs." Lashinksy's book on Apple's corporate culture, entitled "Inside Apple," became available earlier this year. It profiled iOS chief Scott Forstall as the company's "CEO in waiting," declaring him the current most likely successor to Cook.